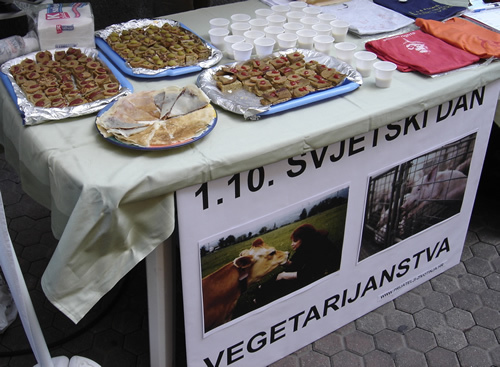 Animal Friends this year too organizes the Animal Friends Days during which it will mark important dates regarding animal rights and protection as well as vegetarianism. 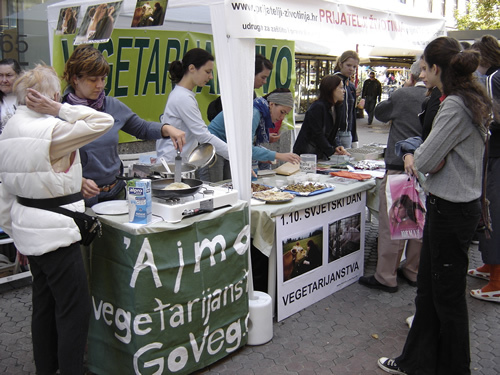 On the informative stall at the corner of Varsavska ulica and Petar Preradovic Square, beside the leafleting of promotional materials, informative billboard and video projection, the visitors of the stall will be able to taste vegan delicacies and at 11 A.M. freshly baked pancakes without eggs and cow milk will be offered. 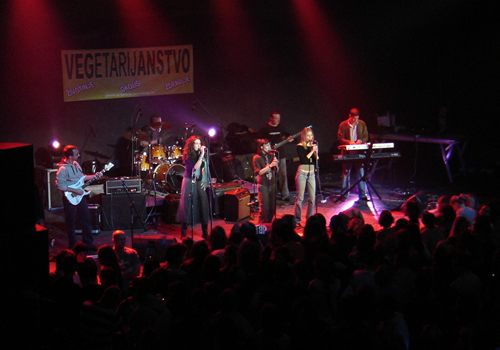 At 9 P.M., Boogaloo Club (ex OTV dom, Vukovarska 68), there will be a big free concert with the vegan tasting. 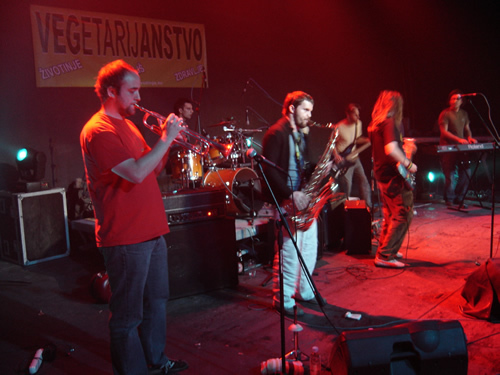 The following bands will play: Flyer, Brain Holidays, Hakoona Matata, Stillness, Antenat, Scroll, and Fraktura mozga. 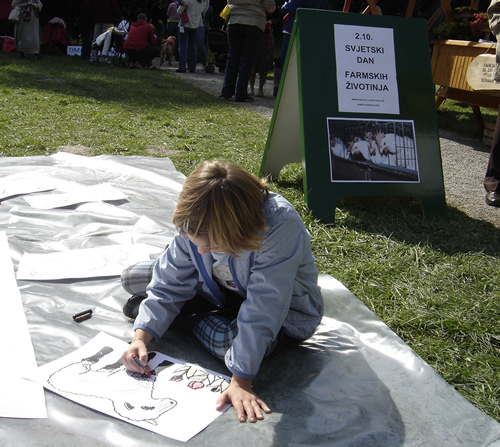 In Maksimir Park, as part of program organized by the City Department for the Agriculture and Forestry, Animal Friends' activists will, in cooperation with FARM USA, inform visitors about the horrors of factory farming in word, picture and video footage. 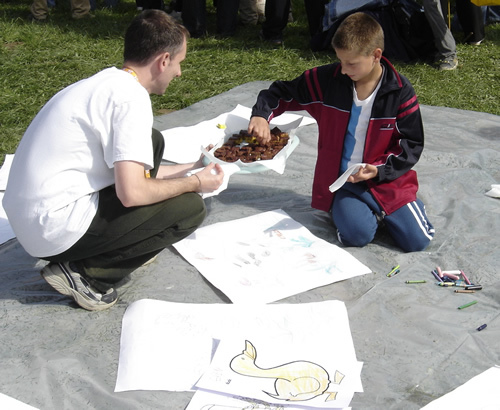 At noon the drawing and coloring of farm animals will be organized for children, who will be rewarded with vegan cakes. In the High school for Classical Languages, Krizaniceva 4a, at 1 P.M. Animal Friends will give a lecture with video projection about vivisection, after which we will hand out the products that are not tested on animals. English activist Anne Ashley, a veteran in the animal rights movement, will be a guest at the lecture. 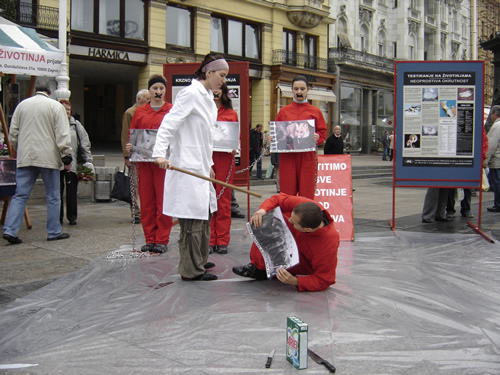 Again as part of the program organized by the City Department for the Agriculture and Forestry, Animal Friends will put an info stand on the Ban Jelacic Square in Zagreb, whilst at 12 noon the performance on the issue of animal protection will be held. 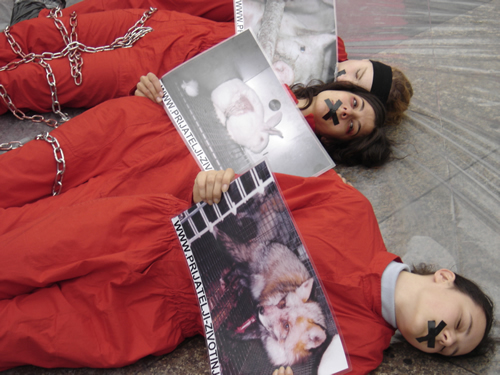 The activists will lie in red overalls and in chains, with their mouth duck-taped, covered with the images of captive animals, so as to bring into focus more than 100 billion animals who die in slavery every year. 8 P.M., in Golden Hall of Komaja Society, Pantovcak 50, there will be a short presentation of the book Eternal Treblinka: Our Treatment of Animals and the Holocaust by Charles Patterson, with a video projection and lecture on animal protection and rights afterwards. 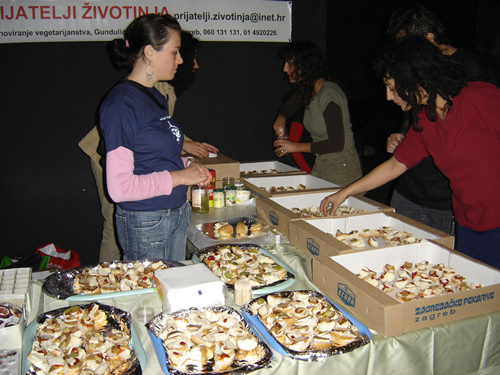 We invite everyone to join us and mark Animal Friends Days during which we will also invite the citizens to join us on the international protest against the dolphin slaughter in Japan, which will take place on October 8, 2005, at 12 noon, in front of the Japanese Embassy in Ulica J. R. Boskovic 2 in Zagreb.